Miami Gardens, FL – Let’s face it. If you grew up in Miami, and your parents aren’t fans of any other college football program, there’s a very good chance that you grew up a Miami Hurricanes fan. There’s a running joke in Miami that states 85% of Canes fans are from Miami Dade College, 9% are from FIU, 5% never went to college, and the rest were lucky enough to overpay for their degrees (unless they earned a scholarship). 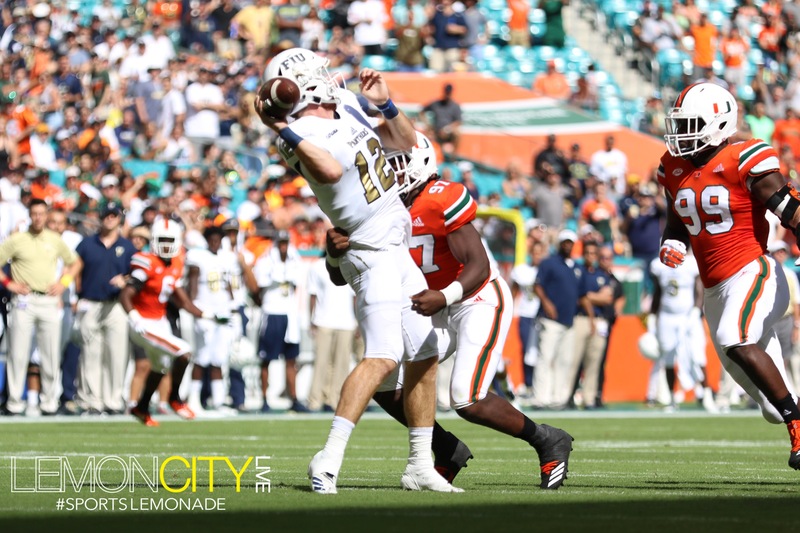 However, this week’s FIU vs UM game made some FIU Panthers reevaluate their Canes loyalty. Butch Davis has his FIU program headed in the right direction. Last season they appeared in their 3rd bowl game, in only Coach Davis’s 1st season none-the-less! This past offseason Butchy-Mane earned the #1 rated recruiting class in Conference USA. He knows the importance of recruiting in FIU’s backyard of South Florida. It’s the biggest hotbed of football talent in the nation! If you haven’t been paying attention to college football, you might not have noticed that, last season, the UCF Knights won the National Championship (yeah, I’m taking that stance) after going undefeated, and defeating Auburn in the Peach Bowl. UCF is not a power-five conference school, and they aren’t always as dominant as they were last season, so is it really crazy to think that Butch Davis could transform FIU into the next UCF? The Panthers are even set up to continue their growth post-Butch, with former Cane, Ken Dorsey serving as the Assistant Athletic Coordinator, which I believe, completely unfoundedly, that he’s being groomed to take over once coach Davis decides to call it quits. Everyone wants to say they were there from the beginning, so we’re finally starting to see fans show up and support the squad after recent successes, which includes a 28-20 win over Old Dominion, who defeated Virginia Tech this weekend! Malik Rosier has been the starter for Miami up to this point, and as much as Canes fans would all like him to succeed, he’s just not the guy who’s going to lead the Canes to a College Football Playoff birth. It seems that Christmas came early for Canes fans. Everyone knows that when you have subpar QB, the most popular guy on the squad is his backup. In comes N’Kosi Perry. Canes fans have been clamoring for Perry to replace Rosier since last season, and their wishes were finally granted early in the 1st quarter after Malik failed to score in Miami’s 1st couple of drives. N’Kosi balled out, going 17/25 for 224 yards, three TD’s and only one interception in his 1st game taking the helms. FIU LB, #5 Edwin Freeman admitted that they were caught off guard by the substitution of Rosier for Perry. They had prepared for Malik, and it showed through the stark contrast of the first two drives of the game compared to what came after. The 1st quarter ended 7-0 in favor of Miami after Perry led Miami to a 9-play, 87-yard TD drive, using both his legs and his arm to move the ball downfield, capped off with a Travis Homer TD. The 2nd quarter began with a 26-yard N’Kosi TD pass to Lawrence Cager. A couple of drives later, Safety, #22 Sheldrick Redwine would intercept James Morgan, bringing out the turnover chain for the first time in the game. This would set up a 14-play, 75-yard drive, culminating in a Bubba Baxa 30-yard field goal. Before the end of the half, with :53 seconds left, Miami would drive 68 yards in three plays, the biggest of which was a 42-yard Perry pass to Mike Harley, and score off a 12-yard TD catch by Brevin Jordan. In the 2nd half, the Canes would only score one more time. In the 3rd quarter, the went 5-plays for 58 yards, capped off with 17-yard Perry TD pass, once again to Lawrence Cager. A nice subplot came in the 4th quarter, when FIU attempted to rally back. At this point, the Panthers were down 31-0, and a blowout was imminent. However, if you follow this Panthers team, you know they play all out until the final whistle is blown. With just under 10 minutes remaining in the game, FIU started a 7-play, 85-yard drive, capped off with a 35-yard Morgan TD pass to CJ Worton of South Dade High School. In the following Canes drive, FIU would force a fumble, recovered by DL, #92 Jason Mercier inside the red zone. However, FIU could only manage a Jose Borregales field goal. With a little over three minutes remaining, FIU converted an on-side kick, and they went on to complete a 5-play, 54-yard drive, once again connecting with CJ Worton on a 44-yard play. The TD was a 5-yard pass to Worton. FIU once again attempted an on-side kick, but the ball was brought in by the Canes. That was the ballgame. Canes win 31-17! The future is bright for both programs. Miami seems to have finally solved their QB woes. Perry is comfortable going mobile, but the kid’s arm is legit, and Richt has a history of developing QB’s. We’ll see how Perry does vs. North Carolina on Thursday, when the Tar Heels visit The Rock for the Miami’s 1st ACC matchup of the season. FIU, on the other hand, is rebuilding, but Butch and his coaching staff have proven that they know how to bring the best out of their players. James Morgan has solidified himself as the starter, and he won’t face another pass rush like Miami’s this season. Look for Morgan and Worton to continue connecting throughout the season. Next up, FIU faces Arkansas Pine-Bluff on saturday, from The Ricky. I’m excited to see when all of Butch’s recruits start to takeover the squad, as upperclassmen, how they’ll compete against power-five conference schools. Schedule all non-conference games with power-five conference schools and make a run, Panthers!